Features CFA artists Wang Dongling, Qiu Zhijie, Yang Jiechang, and Ai Weiwei. 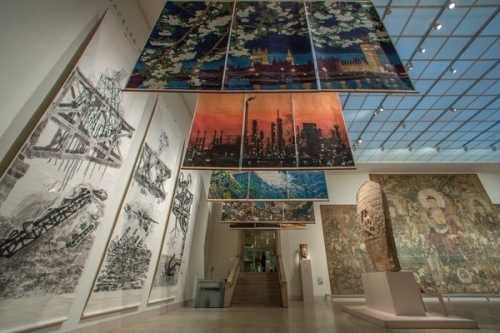 The first major exhibition of Chinese contemporary art ever mounted by the Metropolitan, Ink Art explores how contemporary works from a non-Western culture may be displayed in an encyclopedic art museum. Presented in the Museum's permanent galleries for Chinese art, the exhibition features artworks that may best be understood as part of the continuum of China's traditional culture. These works may also be appreciated from the perspective of global art, but by examining them through the lens of Chinese historical artistic paradigms, layers of meaning and cultural significance that might otherwise go unnoticed are revealed. Ultimately, both points of view contribute to a more enriched understanding of these artists' creative processes. For more than two millennia, ink has been the principal medium of painting and calligraphy in China. Since the early twentieth century, however, the primacy of the "ink art" tradition has increasingly been challenged by new media and practices introduced from the West. Ink Art examines the creative output of a selection of Chinese artists from the 1980s to the present who have fundamentally altered inherited Chinese tradition while maintaining an underlying identification with the expressive language of the culture's past. Featuring some seventy works by thirty-five artists in various media—paintings, calligraphy, photographs, woodblock prints, video, and sculpture—created during the past three decades, the exhibition is organized thematically into four parts: The Written Word, New Landscapes, Abstraction, and Beyond the Brush. Although all of the artists have challenged, subverted, or otherwise transformed their sources through new modes of expression, Ink Art seeks to demonstrate that China's ancient pattern of seeking cultural renewal through the reinterpretation of past models remains a viable creative path.